This page describes data cable connectors and their pinouts. 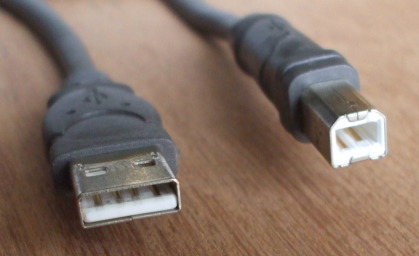 See the audio-video cable page for descriptions and pinouts for HDMI cables. In the beginning, or at least around 1986, was Western Digital's Integrated Drive Electronics (IDE) interface. That defined the low-level connection from a computer system board to a disk storage device. IDE refers to the disk controller being integrated into the drive and IDE providing an interface to a computer bus, initially the ISA bus. The host computer sees the storage device as an array of 512-byte blocks with a simple suite of interface commands. CableWholesale.com has a nice archive of technical articles about cables, connectors, how to choose and use them, etc. That led to AT Attachment and AT Attachment Packet Interface standards, so ATA/ATAPI is a complicated but accurate designation. In 1994 Western Digital introduced Enhanced IDE (EIDE) or ATA-2 drives. Roughly 2007-2009 Serial ATA or SATA largely replaced ATA/ATAPI technology on motherboards, leading to ATA being renamed PATA for Parallel ATA. SATA uses the same command set as PATA, but it uses high-speed serial cables moving data at 1.5, 3.0, and 6.0 Gbps. DD0 - DD15 — Data line 0 through 15. IOCHRDY — I/O channel ready. 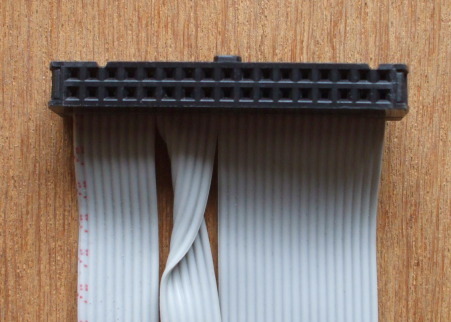 With the arrival of the Ultra DMA/33 mode, the cable went from 40-conductor to 80-conductor ribbon cable. The added 40 conductors are all ground lines, reducing crosstalk of the higher speed signals from what would have been adjacent conductors on 40-conductor cables. Refer to the above picture and caption for the layout of PATA connectors. This table is rotated 90° from that table to fit into your display. Pin 20 is usually not there, it may be a blank spot on the plug and missing a pin on the drive or motherboard connector to force plugging it in correctly oriented. But some flash drives use it to supply VCC to the drive. Pin 28 is connected at the motherboard and master drive (far end) connectors, but not at the slave drive (middle) connector. Pin 34 is connected normally (that is, to conductor #34) at the motherboard and slave drive connectors, but connected to ground within the motherboard connector. PATA disk drive. PATA data connector at left. Power connector at right. Six pins to add a jumper to select master versus slave device between them. Notice that pin 20 is missing. Also see the notch at top center in the black plastic shell to made with the bump on the connector, forcing correct orientation. PATA disks will have their data and power connectors on opposite ends. In between will be a set of jumper pins in which you can set the device to be the master or slave, or explicitly set it for "cable select", or leave off the jumper and allow it to use cable detection. Cable select is the right choice for modern hardware. It may be marked as "CS" in a small diagram included on the label on the device case. Now, as for how to set the jumper, refer to the documentation for your disk. There is no general rule. Ask Google the manufacturer name and model number to find out how to set the jumper. As you see from this stack of three disks, the number of available jumper pins varies. The disk at top has six jumper pins, the one at middle has eight, and the one at bottom has ten. 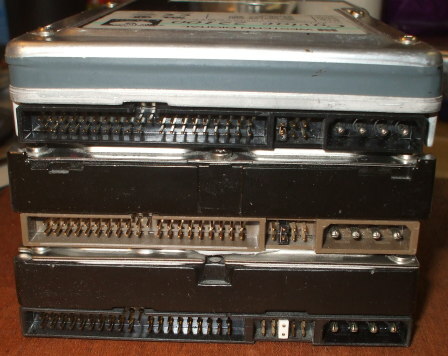 Three PATA disk drives with six, eight and ten jumper pins. 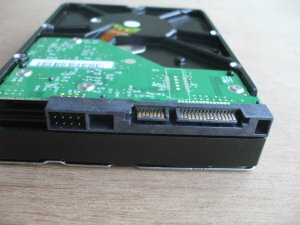 Disk drive with SATA data (center) and power (right) connectors. The contact areas on the pins are small, so multiple pins are ganged together for ground and the various voltages. Used for smaller devices, such as notebook drives. Used for 1.8-inch drives with SATA 2.6. First-generation SATA, now called SATA Revision 1.0 or SATA 1.5 Gbit/s, moves data at 1.5 Gbit/second. The data encoding overhead reduces the actual throughput to 1.2 Gbit/s. SATA Revision 2.0 or SATA 3 Gbit/s doubles the data transfer rate and adds command queueing. SATA Revision 3.0 or SATA 6 Gbit/s was specified in 2009. However, mechanical drives could barely saturate a SATA 3 Gbit/s link, so there was little market for SATA 6 Gbit/s until drive I/O speed increased significantly. SATA Revision 3.1 was defined in 2011. SATA Revision 3.2 increased the speed to 16 Gbit/s. 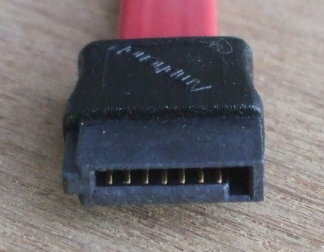 USB cable, Standard A connector at left and Standard B connector at right. The contacts are numbered as laid out in these tables. 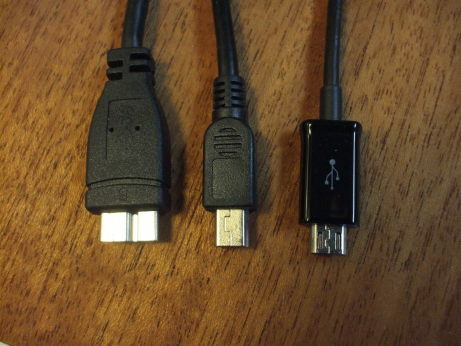 Left to right: USB Micro-B for USB 3.0, USB Mini-B, and USB Micro-B for USB 1.x/2.0 connectors. Mini-B and Micro-B for USB 1.x/2.0 are shown with pins 1, 2, 3, 4, 5 left to right. 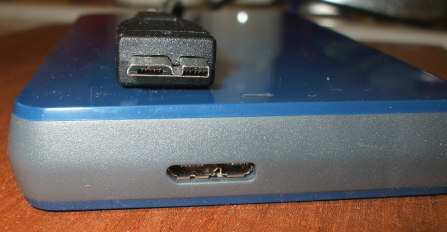 USB Micro-B connectors for USB 3.0 on a 1 TB external disk drive. 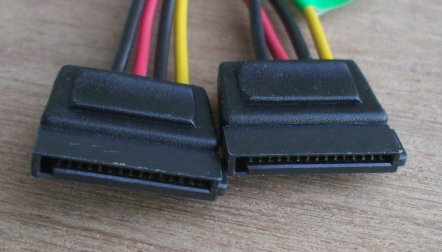 Left-to-right are pins 10, 9, 8, 7, 6 in the left half, and 5, 4, 3, 2, 1 in the right half of each connector as seen here.